The expiration of tax incentives and subsidies, along with new restrictions on car purchases in Beijing, slowed sales, which had grown at a double-digit pace every year since 1999 - apart from in 2008. Sales that year, at the height of the global crisis, rose 6.7 per cent. Car sales in China soared in 2010 after the government cut sales taxes and offered subsidies to spur demand, but growth slowed once the incentives ended. ``This data was what we expected,'' said Jia Xinguang, managing director of the China Automobile Dealers Association, attributing the slowdown mainly to the end of preferential policies for car purchases. China's market is bound to continue to expand, given the relatively low level of vehicle ownership among increasingly affluent families. But while some analysts are forecasting slightly better prospects for 2012, most do not expect a return to the torrid growth of the past. The development of China's auto industry will be limited not by market demand or economic growth, ``but by severe traffic congestion, air pollution and energy shortages,'' said Jia. The cooling of the housing market, a key driver of growth for car sales to families that often end up moving to distant suburbs, also is stunting growth, says Zhang Xin, an analyst at Guotai Jun'an Securities, based in Beijing. CAAM said sales of SUVs climbed 20 per cent, to 1.6 million, while sales of sedans rose 6.6 per cent to 10.1 million units. Sales of vans and minivans, which boomed while the subsidies and tax breaks were in effect, have since slumped. Commercial vehicle sales fell 6.3 per cent last year from a year earlier, to 4.03 million units. Domestic automakers have been hit hardest as their profit margins have been shrinking due to rising costs and intense competition on prices. China surpassed the United States to become the world’s largest automobile market in 2009. About13.9 million vehicles were sold in China in 2009, according to the China Association of Automobile Manufacturers, a 45 percent increase from the previous year. By comparison 10.43 million cars and light trucks were sold in the United States in 2009. The increase was all the more remarkable as sales almost everywhere in the world slumped because of the global financial crisis.The Chinese figures was well above the country’s target for 2009 of 10 million vehicles. The American figure was 21.2 percent less than the previous year and a 27 year low. The increase in sales in China was helped by the reduction of the sales taxes on small cars by 50 percent and vehicle subsidies in rural area. Vehicle sales, including cars, buses and trucks, reached 18.06 million in 2010---nearly 50,000 a day and a 32 percent increase from the previous year---according to the China Association of Automobile Manufacturers. The sale of passenger cars, including multi-purpose vehicles and SUVs, increased to 13.8 million from 10.3 million in 2009 and accounted for the biggest chunk of sales. Most vehicles were sold to first-time buyers, according to Michael Dunne, an independent auto analyst based in Hong Kong. The boost in sales was pushed by China’s rapid growth and stimulus measures taken by the government after the Lehman crisis. The number of cars and light trucks sold in China was one-tenth of that in the United States in 2000. Sales of cars began to take off in 2000 and reached the 1 million mark in 2002. Sales of cars has grown by 20 percent to 30 percent a year since 2005. China surpassed Japan to become the world’s second largest car market in 2006. Around 9.4 million cars were sold in 2008. Automobile sales increased 16 percent in May in 2008 despite the massive earthquake in Sichuan. Sales barely missed a beat during the economic crisis in 2008 and 2009. In 2009 car sales reached the 1 million a month mark. Small cars account for nearly two thirds of all cars sold . Commercial vehicles make up a much larger percentage of vehicles sold than in the United States and Japan. The expansions of China’s road and highway network coupled with the expanding middle class is a formula for robust car sales in the years to come. General Motors predicts that China’s car market will be twice the size of the United States’s by 2020. But not so fast. Sales have slowed from the spectacular 20 percent-30 percent expansion in the 2000s due to rising fuel prices, curbs on licence registrations in Beijing and government efforts to promote public transport. Geely Dadao China had about 85 million passenger cars plying its roads in 2010, about 40 percent fewer than in the United States. Car registration in Beijing increased to 4.8 million from 2.8 million between 2005 and 2010, with 700,000 new cars registered in 2010 year alone. Beijing and Guangzhou and Guangdong Province have large numbers of privately-owned cars. Beijing is China’s largest car market. There are considerably less in Shanghai in part because of the difficulty there of getting licences. But Shanghai is catching up. It recently banned bicycles from the main roads to make more room for cars. Small cars account for nearly two thirds of all cars sold . Commercial vehicles make up a much larger percentage of vehicles sold than in the United States and Japan. China’s best selling car is the M1, a 1,000cc to 1,300cc compact from domestic maker Chery Automobile Co. that goes for about $4,500 to $6,000. According to the Chinese Association of Automobile Manufacturers, top-selling cars in the nation are those with engine capacities less than 1,600cc and priced at about $8,000. Light commercial vehicles, called "bread vans" due to their loaf-like appearance, are especially popular in farming districts. Chinese consumers who make more than $8,000 per year reportedly buy cars at about the same level as their annual incomes. As Chinese have become richer they have shown a great hunger to purchase cars. The transformation of Beijing and Shanghai from bicycle-dominated cities to car-dominated ones and the speed in which it has happened are proof of this. The middle class is beginning to purchase vehicles in large numbers. For them a car is a sign of having made it in life. Cars are still way too expensive for most people. The increase in car ownership has given Chinese more freedom, undermined the control of the government and boosted the economy by helping industries that rely on cars such as steel makers. It has also caused traffic jams, pollution and road deaths. One of the lingering effects of SARS panic was that Chinese began avoiding public transportation and seeking more private space, something which automobile are ideal for. Sales of passenger cars boomed. In the mid 2000s cars sales started to drop and auto dealers had to cut prices and offer freebies and other incentives to get people to buy cars. Car salesmen that were selling cars on the spot faced showrooms empty of customers and spent their time making cold calls to stir up business. Dealership improved the feng shui of their showrooms. Most of the cars that were sold tended to be small cars with relatively small profit margins. In recent years cars sales have been hurt by restrictions on lending, imposed by the government to cool down the economy; high gas prices, increasing traffic, lack of parking spaces, and the desire by buyers to wait for prices to drop lower. Post Office vehicle In China there is roughly one vehicle for 28 people, roughly the same rate as the United States in 1915. By contrast there are 1.8 in the United States and 1473 automobiles per person in Ethiopia. In 1995, there was one automobile per 522 people in China. As of 2008, there were about nine cars to 1,000 residents, compared to 450 in the United States. Four million to 5 million new cars and trucks are sold every year. About 140 million vehicles are expected to be on the road by 2020. By contrast in 1990, only 6,000 passenger cars were sold and most of them went to government agencies, and high-ranking government officials and businessmen. Growth in China culminated in a burst of sales in 2009 and 2010 as the government cut taxes on car sales to stimulate the economy during the global economic downturn. If Chinese were to possess the number of cars per capita as Americans, lets say in 20 years, when China’s population reaches 1.45 billion, then Chinese would own 800 million cars. The road, highways and parking lots needed to accommodate these vehicles would eat up land equivalent to all the land that China uses to produce rice. Perish the thought of what would happen to world’s energy supples. 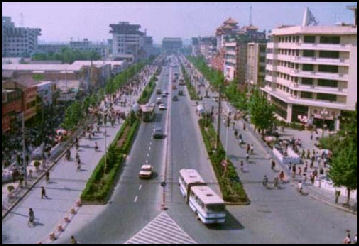 In Beijing in the 1990s bicycles outnumbered cars by a large margin and traffic jams were largely unheard of. Now traffic jams are a fact of life and situation is expected to get worse before it gets better. As of 2007 three million cars were registered in Beijing and 1,000 new automobiles took to the streets every day. By contrast there are about 2 million vehicles registered in New York City. In Beijing car ownership has been increasing at a rate of 15 percent a year while urban road growth has increased only three percent. Big cars sell surprisingly well in China. the dream of many people, even ones without a lot of money, is to have a chauffeur-driven car with extra room in the back seat. That is why even large cars in China are a foot longer than their counterparts in the United States. Another reason big cars sell well is the drive to embrace the suburb dream of a big house and big car. Buicks are popular among the Chinese elite. Both Sun Yat-sen, father of the modern Chinese state, and Zhou Enlai, respected Communist leader, favored classic black Buicks. China is the No. 1 market for Rolls Royces. The price of the most popular Rolls Royce model sold in China is $397,000. 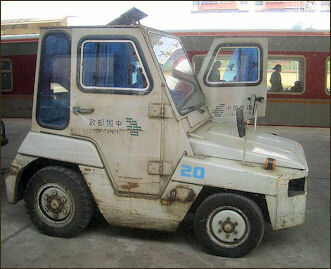 In the mid 2000s, a Hummer sells for $220,000 in China, including hefty shipping and import fees from the United States. Owners include businessmen, coal mine owners and the wives and girlfriends of businessmen, coal mine owners. A owner of a Hummer and a graphic design company in Shanghai told the Washington Post, “In China, size matters. People want to have a car that shows off their status in society. Noone wants to buy small.” In certain quarters, SUVs sell well eve when gas prices are at all time highs. Take, for example, Mercedes-Benz, a brand that in much of the world suggests moneyed respectability. In China, many people think Mercedes-Benz is the domain of the retiree. The Buick, long associated in the United States with drivers who have a soft spot for the early-bird special, is by contrast one of the hottest luxury cars in China. The lower rungs of the Chinese market are still dominated by domestic brands like Chery, whose name and numerous models suggest more than a passing resemblance to Chevy. The affluent, however, are flocking to an increasingly diverse array of foreign luxury offerings. The rapid market expansion has presented some foreign carmakers with a chance for brand reinvention, while posing public relations challenges to others. “Because the market is so young, brand perceptions and a car’s face—“an idiom meaning prestige or repute”---are both critical,” said Mr. Zhang, pointing out that 80 percent of car purchases are made by first-time buyers. Audi’s party technocrat associations are a result partly of the car’s early market entry and its longstanding place on the government’s coveted purchasing list. Audi, the German automaker, gained access to the Chinese market in 1988 when its owner, Volkswagen, struck a joint venture with Yiqi, a Chinese carmaker. By contrast, BMW’s first domestic factory opened in 2003, giving Audi 15 years to establish itself as the premier vehicle for China’s elite. This early advantage has helped Audi to dominate China’s lucrative government-car market, with 20 percent of its China revenue in 2009 drawn directly from government sales. Each year, the Procurement Center of the Central People’s Government releases a list of the cars and models acceptable for government purchase. While the A6 has long been a mainstay on the list, which had 38 brands in 2010, BMW made the cut only in 2009. “When people see government officials in BMWs, they automatically suspect corruption or malfeasance---but Audis are to be expected,” said Jessica Wu, a public relations professional with almost a decade of experience in the Chinese car industry. A basic model Audi A6 costs 355,000 renminbi, or $56,000, while the BMW 5 series Li costs about 428,000 renminbi, or $67,520. Such market positioning has brought significant financial results for Audi---in 2010, the company sold 227,938 vehicles in China, more than double the number in the United States. More recently, a driver in a BMW M6 struck and killed a pedestrian in May during an illegal street race in the city of Nanjing, setting off a public outcry. “If it hadn’t been a BMW, I don’t think it would have been as big of a deal,” said a young man who had taken part in the race and spoke on the condition of anonymity because he was awaiting trial. “Had it been all Toyotas, Mitsubishis or even Audis, I don’t think it would have provoked as dire a reaction.” Despite such public relations travails, BMW has posted strong sales in China, selling 121,614 units in the first two quarters of 2011, or 27 percent of the company’s total sales during that period. The American carmaker General Motors has found the Chinese market to be a life-saving opportunity for the reinvention of the Buick brand. Since 2005, when Bob Lutz, the vice chairman of G.M., famously declared Buick a “damaged brand,” America’s oldest surviving automobile make has successfully positioned itself in China as a top-tier luxury carmaker. Largely the result of effective marketing and remodeling, China’s romance with the Buick also has historical roots. The last Chinese emperor, Pu Yi, was the proud owner of two Buicks, as was the country’s first provisional president, Dr. Sun Yat-sen. The black Buick 8 driven by a onetime premier, Zhou Enlai, is still displayed at his former residence in Shanghai, now a museum. In 2010, Buick sold over 550,000 cars in China, more than triple its sales in the United States. “We joke that our market revived Buick from the dead---it’s only partly a joke,” said Liu Wen, a reporter for China Auto News. No wonder we are choking. Despite all the promises of green growth and reduced emissions, traditional car sales are accelerating, while efforts to shift towards "greener" hybrid and electric vehicles are stuck in neutral, particularly in the place where it matters most. According to the trade journal, Ward's, a record 35m new vehicles were sold worldwide last year. That is 95,500 extra cars being added to the global traffic jam every day. Most of the new demand came from developing nations, particularly China. But the country's efforts to promote "green" cars has been lagging. This is not just affecting Toyota. It had been hoped that generous government subsidies and policy support would help domestic manufacturers like BYD to leapfrog better established overseas rivals by mass producing electric cars. The big brands would like more of the same - and argue there is room for growth. Only one in 16 Chinese people own a car, which is less than half the global average. If the country were to match the three-in-four ownership levels of the US, that would mean an extra 900 million vehicles. Given the frequent traffic and smog even at current levels, I cannot imagine that ever happening. Even if all the new cars were hybrid or electric, the congestion would be incredible. "Green growth" looks a distant prospect. China is more likely to simply slow down. Keith Bradsher wrote in the New York Times: “After a decade of nurturing China’s auto industry to become the largest in the world, this country’s leaders are having second thoughts. A succession of government officials at a conference in called for China’s automakers to shift their focus from making ever more cars and toward producing more fuel-efficient and more advanced models, including gasoline-electric hybrids and all-electric cars. The government officials did not say how they would restrict growth. But growth has already slowed partly because of limits on the number of new cars that can be registered each month in Beijing, and mostly because government incentives expired at the start of 2011. Those incentives were subsidies for rural buyers and a two-year reduction in the sales tax on new family vehicles. Mr. Jiang said that he expected other cities to do so. “Beijing is a very typical city from which other cities may learn,” he said. Zhao Hang, the president of the China Automotive Technology and Research Center, a government-affiliated complex of laboratories based here that organized the conference and that collaborates closely with automakers, expressed misgivings about further limits on car registrations. He said that the limits could discourage the replacement of older cars. "There is an 'honor' for China now that I really don't take as an 'honor'. China leads the development of the global automobile industry. I cannot help but wonder, when on earth did we begin to lead the development of the global automobile industry? The world laughs because they regard us as their market...I never stood for giving fiscal subsidies to boost the automobile industry. I am always for strengthening compulsory education in rural areas," Zhu said. Beijing's plan will provide unspecified incentives to buy so-called new-energy cars, including electric vehicles. It pledged to upgrade equipment at electric-vehicle charging stations and build more of them, Xinhua said. Beijing has also increased parking fees, built parallel roads, widened certain intersections and expanded its subway system, all to try to relieve traffic congestion. Bradsher wrote, "The biggest question in the car industry is whether more cities will follow Beijing’s example and impose restrictions on car registrations. Shanghai has restricted registrations since 1994 to prevent its ancient streets from becoming overwhelmed. As a result, it has one-third as many registered vehicles as Beijing, even though the populations of the two cities are similar. Shanghai is unusual because its historic city center has many narrow old streets. But with the exception of Guiyang in southern China, most Chinese cities have been awaiting signals from Beijing on whether to follow suit. The sale of cars is expected to slow in 2011 as a result of measures imposed by some cities to restrict the number of vehicles and the withdrawal of polices that encouraged car purchases. Auto executives and industry analysts say that the market will continue to expand but they forecast that the growth rate is likely to fall to 10 percent after averaging 25 percent a year for the last decade. “Stable growth is much better for us,” Toshiyuki Shiga, the chief operating officer of Nissan, said at a news conference at the Guangzhou auto show in December 2010. One worry is that as car sales growth slows China may start discriminating in favor of domestic automakers and against joint ventures that are producing cars with international brands. China already limits foreign automakers to 50 percent stakes in manufacturing joint ventures. “If regulatory restrictions on car registrations become widespread, it may tempt the Chinese to game domestic auto sales as they have renewable energy,” another sector in which China has adopted domestic content rules and other restrictions on multinationals, said Paul Bledsoe, a former Clinton White House climate official, told the New York Times. Overproduction of Cars in China’s Near Future? J.D. Power & Associates, the global consults, estimated last month that China would have a manufacturing capacity of 31 million vehicles by 2013. Yet the domestic market has decelerated sharply this year, with sales of family vehicles up just 5 percent in the first seven months, compared with the period a year earlier. By contrast, sales had soared 33 percent in 2010, compared with 2009. What would happen to the automobile industry’s emerging overcapacity was largely unaddressed at a conference in 2011. Much slower sales growth has prompted strong lobbying by the auto industry for a renewal of government incentives. But if anything, policy makers seem to be leaning toward more limits to address China’s steeply rising dependence on imported oil and its traffic jams, air pollution and shortages of land in many areas for more road construction.